He told us we had to take a long way to get round the fence, which he explained would kill you, roast off your skin the moment you touched it, like the wires high up on the poles that give electric light in our towns. I’ve seen that sign of a head without eyes or skin or hair on an iron box at the mission hospital we used to have before it was blown up. Tourist at the described electric fence via a travel blog. To get there we had to get to Kruger Park. We knew about Kruger Park. A Kind of whole country of animals – elephants, lions, jackals, hyenas, hippos, crocodiles, all kinds of animals. We had some of them in our own country, before the war (our grandfather remembers; we children weren’t born yet) but the bandits kill the elephants and sell their tusks, and the bandits and our soldiers have eaten all the buck. There is a man in our village without legs – a crocodile took them off, in our river; but all the same our country is a country of people, not animals. We knew about Kruger Park because some of our men used to leave home to work there in the places where white people come to stay and look at the animals. Long ago, in the time of our fathers, there was no fence that kills you, there was no Kruger Park between them and us, we were the same people under our own king, right from the village we left to this place we’ve come to. VS. the white bone; Sentiments echoed in human behavior at the Safe Place. Our Grandmother looked away from her an spoke – There is nothing. No home. Why does our grandmother say that? Why? I’ll go back. I’ll go back through the Kruger Park. After the war, if there are no bandits any more, our mother may be waiting for us. And maybe when we left our grandfather, he was only left behind, he found his way somehow, slowly, through the Kruger Park, and He’ll be there. They’ll be home, and I’ll remember them. Do the characters in the white bone ever plan to “go back” once they find the Safe Place? How is memory treated in each story? Here are a few clips I found while researching Soylent Green that I thought were super hilarious or interesting, but wasn’t smart enough to work into the presentation. 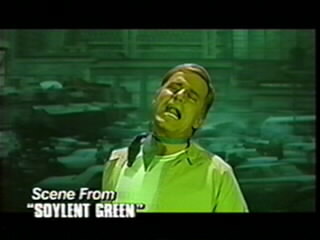 90’s era SNL Soylent Green sketch – This one probably shows my advanced age, but I remember watching this when it originally aired. I couldn’t find the entire clip; it’s just the Phil Hartman bits. The concept of the sketch is how Hollywood unsuccessfully tried to make Soylent Green into a franchise. A Passing reference to Soylent Green in a futuristic scene of the Simpsons. Soylent Green Crackers– a real product available at thinkgeek.com. Extra Info on the opening Montage via IMDB. Is it not strange that sheeps guts should hale souls out of men's bodies? Much Ado About Nothing, as adapted by Kenneth Branagh, places it’s tongue firmly in cheek and throws subtlety out the window. From the get go, we’re treated to an opening series of shots that are a stones throw away from being a montage of sexual arousal. From raising the flag, to the well placed shot of a horse, to when the men (to include Claudio and Benedick) arrive victorious from battle, and immediately thrust their fists in the air(if that’s not representing erections, I don’t know what is) at the sign of the lounging ladies(to include Hero and Beatrice). We watch a multitude a naked, healthy young people happily bathe together and think,”What could possibly go wrong?” As a side note, was I the only one that noticed the women bathing in the opening scenes had bikini tan lines? While Claudio and Hero(both actors in their twenties, though Kate Beckinsale is barely out her teens, and I suspect Robert Sean Leonard is playing younger) seem to fall into love effortlessly and embrace the momentum, their older counterparts Benedick and Beatrice( Branagh and his then real life wife Emma Thompson well into their thirties) essentially fall in love at first site as well, but fight against every impulse to admit it. Out of a jealousy, Don John does his best to create a rift between Claudio and Hero, meanwhile out of boredom, his half brother Don Pedro conspires to “set a lover’s trap” for Benedick and Beatrice. It’s telling that matchmaker Don Pedro is played by a dashing Denzel Washington, while the anti-cupid is played by a scruffy, sullen (and as always, wooden)Keanu Reeves. Only a passionless automation would want to break apart the innocent road Hero and Claudio are on, while an emotional and sexually powerful figure would pave the way for Beatrice and Benedick to just shut up and accept their fates. Though outwardly, Benedict seems to be in disbelief of the yarns being spun around him concerning Beatrice, it is pretty clear that he’s pathetically hopeful that they are true. Meanwhile, Claudio outwardly rejects the lies fed to him about Hero, but quietly casts his own doubts later. It’s interesting that the couple that finds romance so easily in the beginning end up in such jeopardy, while the jaded(some would say modern) couple that fight the very idea of romantic love as the backbone of their being inevitability find their way to each other.